If you learn intel, or engage with your Customers in any way outside of a ticket, these interactions can be added as Activities. Activities organize non-ticket related information that the whole team can use to understand and build the Customer relationship. Activities allow your team to own the customer relationship post sale. While tickets capture “transactional” activities that typically happen via email, the Activities section can serve as a repository for other non-transactional activities that happen outside of tickets. Leveraging this information will allow for greater continuity in support for your Customer because everyone on your team has awareness of conversations that are shared between all users. Because Activities allow for visibility from both Contact and Customer levels from within the same view, these Customer relationships can be build without leaving TeamSupport. Each Company and Contact has an Activities tab in the Customer section. Activities can be used to describe any type of activity that you have with your Customers. Some ideas are phone calls, site visits, notes about new employees, and important information about the customer that your users should be Alerted about. Number of Activities: The number on the tab Activities tab in parenthesis indicates how many Activities are present on the selected Customer. No Limits: There is not a limit to the number of Activities that are added. Company and Contact Activities: The Company Activities as well as the Contact Activities are displayed in both the Company and Contact levels for increased visibility and awareness. Recent Activities: The 5 most recent Activities for a Customer or Contact are displayed on the business card on the Ticket Page. Posting to the Water Cooler: TeamSupport’s Water Cooler feature allows you to collaborate more closely with your company to better support your customers. You may associate a Water Cooler post to a Customer Activity in order to notify others on your team. Click the Log Activity Button. The following form is displayed. Title: Title is the only required field. This field will be displayed in the Activities list. Description: You may add details to your Activity in the Description field. The Description is used when displaying an Alert. Activity Type: Activity Types help to define a more accurate log of every interaction. There are 4 basic types which are in the list by default (Call, Email, Note, and Visit). 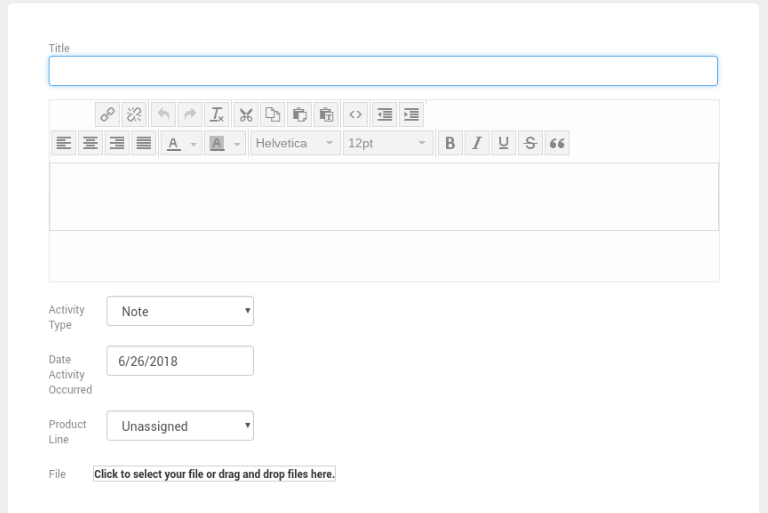 Additionally, you may add/edit custom types in the Admin section. Date Activity Occurred: The current date will be the default. However, you may change the date accordingly, for example, if the Activity happened in the past. Product Line: Product Lines can be defined for each Activity to provide additional context. Additionally, if you select a Product Line for your Activity, only users who have rights to the Product Line will be able to see Activity. File: Files associated with each Activity (such as a presentation or spreadsheet) can be uploaded and attached for convenience. The maximum file size is 25MB per file. 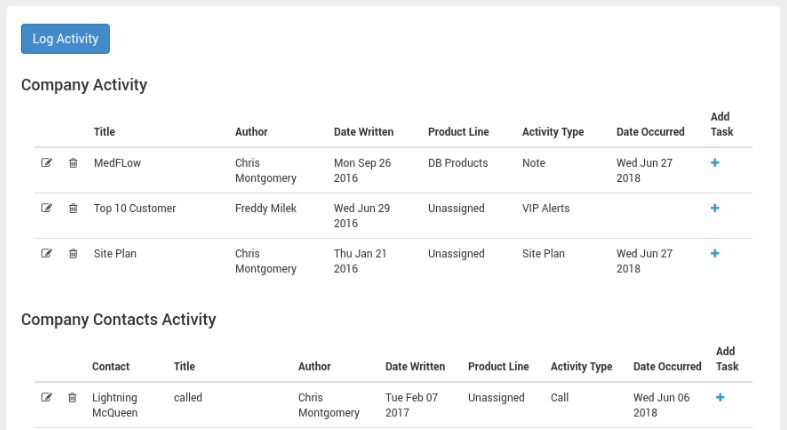 Set as Alert: Customer Alerts allow you to change Activities for Customers and Contacts into an Alert that will pop up on the users screen when viewing a Ticket they are associated with. The pop up will also occur when the user views the Customer or Contact from the Customers section. Save Activity/Cancel Buttons: You must press the Save button in order to save your Activity. An important conversation or interaction with your Customer is a common use case for an Activity. Those interactions typically involve one or more Tasks in order to followup with the interaction. You can save some time by adding and associating a Task directly from the Activity by clicking on the + (plus) button on the Activities grid. This opens a New Task window and automatically associates the Activity to the Task. After adding all other necessary information, the Activity association will display as a link on the Task which will open the Activity in a new tab. Click here to learn more about the other fields in the Task window.